Featuring stunning artwork from the highly anticipated video game Destiny, this deluxe writing journal captures the thrilling world of this new game from the creators of Halo. This deluxe writing journal features powerful art from Destiny, including a cover and endpapers inspired by striking visuals from Bungie’s next game. Capturing the sweeping beauty of a brave new world, this journal will allow players to record their own epic adventures. With sturdy construction and sewn binding, this journal lies flat, and the 192 blank, acid-free pages of high-quality heavy stock paper take both pen and pencil nicely to invite a flow of inspiration. All this, plus a ribbon placeholder, elastic closure, and 7.5 x 4.5–inch back pocket, perfect for holding photographs and mementos, makes this Destiny journal the ultimate game-inspired portable journal. 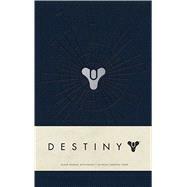 © 2014 Bungie, Inc. All rights reserved. Destiny, Bungie, and the Bungie logo are trademarks of Bungie, Inc. in the US and/or other countries. The creators of the game-changing Halo franchise, Bungie has grown to become a worldwide entertainment phenomenon. In 2010, Bungie teamed up with Activision to continue their mission of developing games that combine brilliant technology, beautiful art, intelligent stories, and deep gameplay.